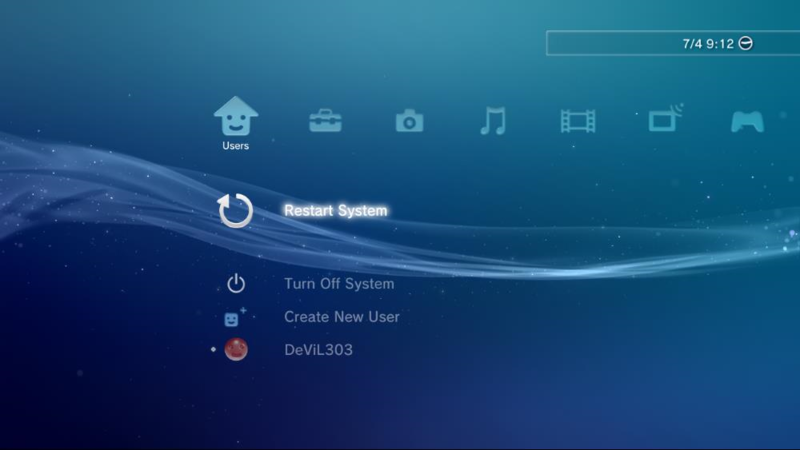 Here is a small XMB mod that changes how the "Turn Off System" icon in the user category works and adds a "Restart System" icon to the top of the user category. This is a full multi language mod with icons and text added to the rco. In this mod, when you select "Turn Off System" you do not get asked for confirmation, its much nicer imo, in all my years using PS3 I do not think I have ever hit that by mistake Also added a link to HAN reboot auto running Xploit page. Thanks to @esc0rtd3w for discovering the way to call the power off plugin instantly, and thanks to Team Ps3 Xploit for the Reboot Xploit and all the rest. There are a few steps to this and it involves writing files to flash using Team Xploits file injector webpages, if you do not know how to use them do not continue with installing this mod. I am not going to explain every little thing about those, you are expected to have a basic understanding of the tools if you are doing mods like this to flash, if not do some research into the latest PS3Xploit releases first. There are 3 files, put them on USB and copy them to flash, you will need to select the correct file names from the dropdown lists, and choose the USB port etc. You can of course use HAN Toolbox file injector section too, same thing. Note: There is a bug, these items do not work from the ingame XMB, and will have spinning icons, I will not be trying to fix this, so take it or leave it. Use at your own risk, only tested on slim.